For the Sonic Mania version of this stage, see Oil Ocean Zone (Sonic Mania). Oil Ocean Zone is the seventh zone in Sonic the Hedgehog 2. 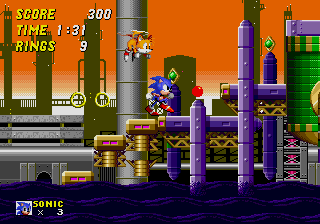 The entirety of this zone takes place across a massive sea of oil dumped by Robotnik which you'll sink into and die if you stand in it, though it's possible to jump out of it. Other features include slippery oil slides like the water slides featured in the Labyrinth Zone, fans that block you from certain paths like in Star Light Zone but can also lift you into the air, networks of balloon-like launchers that take you somewhere, and bursting steam vents that can give you a lift to high places. In the Simon Wai prototype of Sonic 2, Oil Ocean Zone uses the CNZ 2-player music (albeit at a slightly slower tempo). The current music for OOZ was in the Simon Wai prototype, but it was unused and it had a much slower tempo. Earlier versions of this zone featured a smaller version of the rolling ball that was cut out of Green Hill Zone but operated by a button, and while it's nowhere to be found in the final release of Sonic 2 it can be placed via debug mode. Octus - Octopus enemy, levitates and fires a missile when Sonic approaches. Aquis - Seahorse enemy, floats around quickly, firing globules of oil at Sonic. Oil Ocean's "sinking pool" mechanic was reused in Marble Garden Zone, though it's not nearly as expansive there. In this zone, the ground is supported by numerous small pillars that extend down to the oil, but not all the way. Because of this, the player can Spin Dash in the oil while standing against one of these pillars to go under it. In this way, it's possible to travel at the very bottom across the whole stage. This page was last edited on 8 April 2018, at 10:13.